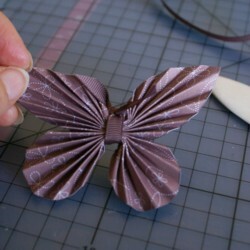 Making a Paper Butterfly is easier than you might think. 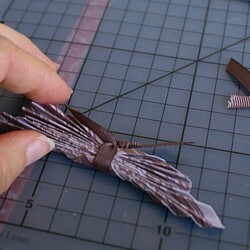 This little project does not use much paper, so save your scraps to make more later. 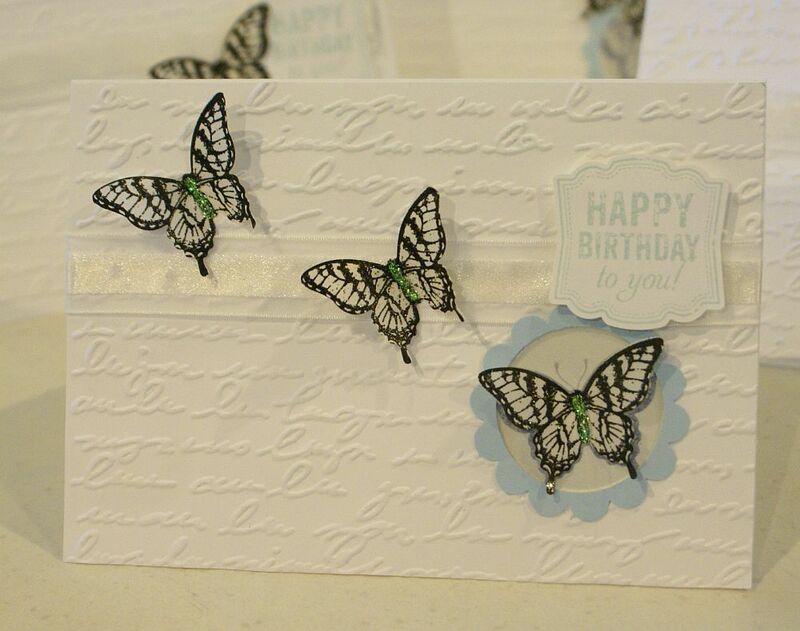 There are some great decorating opportunities for these little 3-d papercraft flutterbys. You can string them singly and make a curtain of them, or make a banner out of them, or make a pretty mobile for a baby's cot. Use them to decorate a special gift or the top of a box. Put a magnet on the back and you have a beautiful fridge or metal filing cabinet decoration. 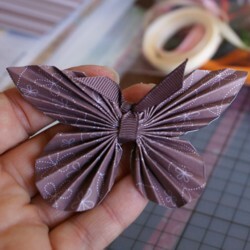 Once you start looking, you can find all sorts of places that could be improved by adding a little paper butterfly. 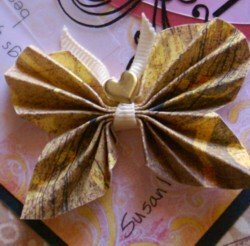 NOTE: There are a few more ways to make a paper butterfly shown below so do scroll down to see all three ways mentioned on this page. The other two have no accordion folds! The pattern shown below. The smaller you make your pattern, the smaller your finished embellishment will be (and the harder to fold!) and the opposite is true too. The larger your pattern, the bigger your finished butterfly will be. Sometimes I use the scraps on my desk to make these when I have finished another project. I always have a couple in my embellishment bag in case one will look nice on something I make. It also reminds me that I actually do know how to make them, so I can remember to whip one up in the right colours when I am looking for a way to add a little whimsy to a project. 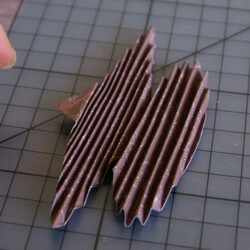 Be sure to let me know if you make one of these little pretties and also how you use them in your papercraft projects. I am sure there are many more ways you could use them and you will be limited only by your own imagination. I hope they bring you and those you create for some happiness. 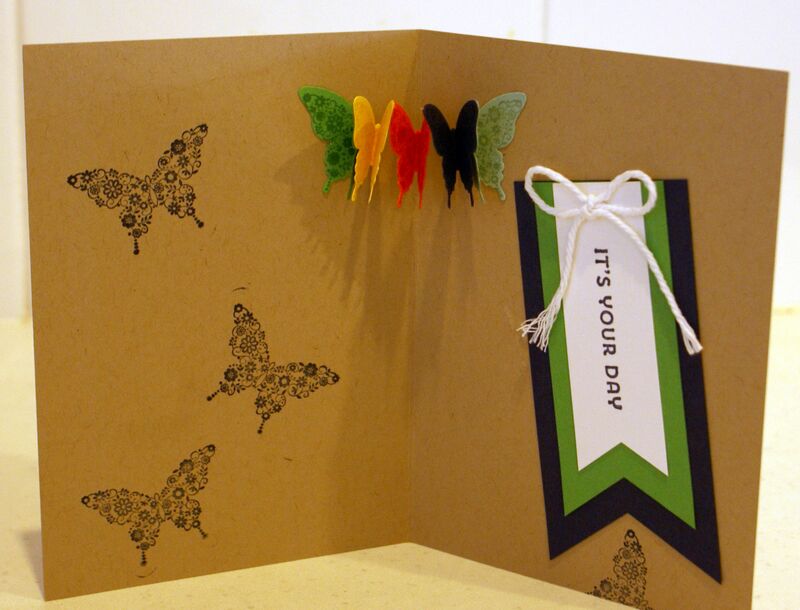 Remember you can always make paper punch and Big Shot butterflies. Stampin' Up! has a great choice of punches and dies to make them in all sorts of sizes. PS: Here are some examples I found on Pintrest to inspire you some more. Stampin' Up! used to have two butterfly punches. The larger of the two is called the Elegant Butterfly and the smaller is called the Bitty Butterfly. I used them to layer one on top of the other to make an accordion banner for this card. To make one you need to punch your shapes, fold them in half then glue the wing tips of each one to the wing tips of the next. If you glue the entire wing together you get a very tight banner. Gluing the wing tips only allows your banner to open up more easily. I glued my shapes together then closed them all up. I glued one end of the banner inside my card, then added adhesive to the wing on the other end. After that I closed my card up to ensure the wing was glued to the right spot and would allow the banner to open evenly. 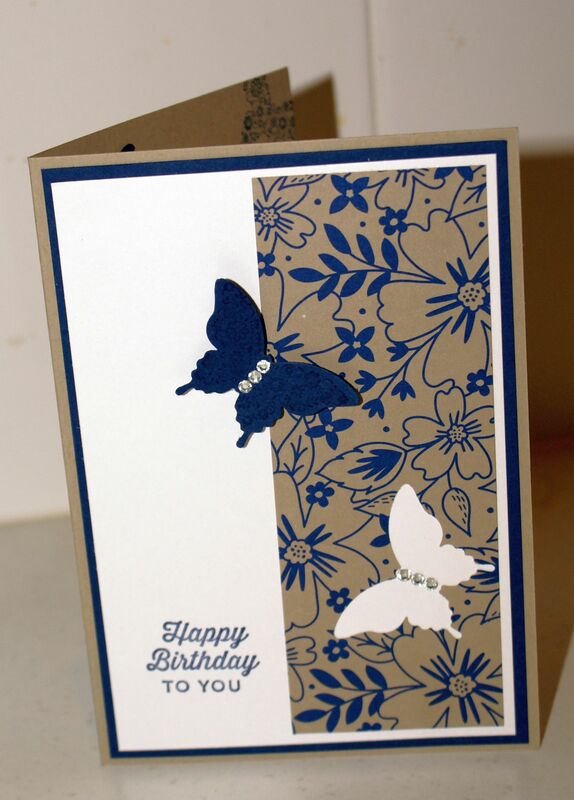 Then I added some stamped images from Papillon Potpourrie stamp set and made a tag also with the Banner Triple punch. 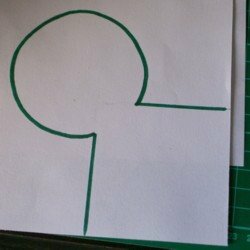 I used my punch to cut out a negative shape on the card front from double-sided designer series paper. Then I flipped the cutout over, folded it in half and applied glue to it's body only and adhered it on the card elsewhere. I used the Affectionately Yours Specialty designer series paper (retired). Don't you think it looks like the winged one is flying off the card? Whatever colour your card base is can determine the colour of your cutout. Here I stamped my images on vellum cardstock with Stazon (black) ink before cutting them out with the punch. The stamp set is the Papillon Potpourri one. I have loved that set since it first came out. You can make spectacular shapes with your Big Shot and some framelits and thinlits. 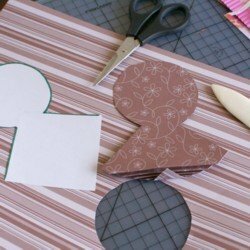 Here are some ideas for using them to make even more paper butterfly shapes. I added one to a card to just show you some of the possibilities. 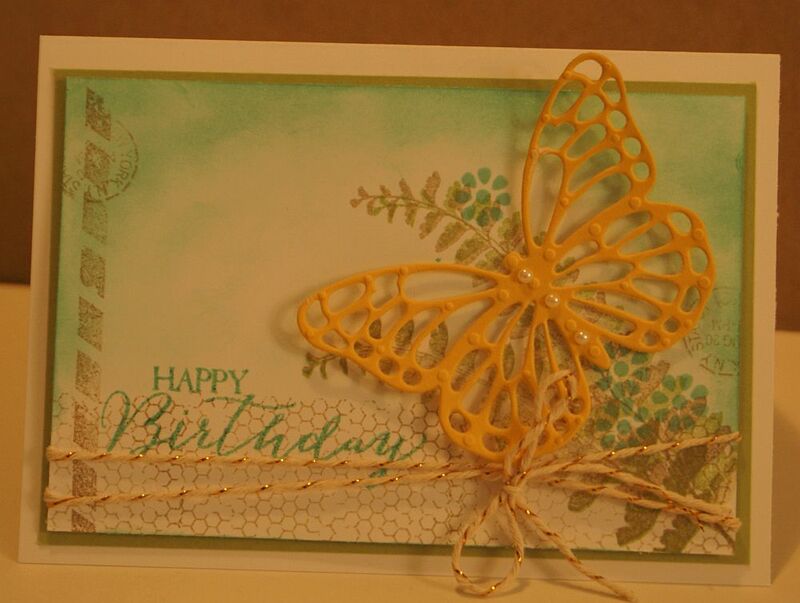 I paired the shape with a stamp set and some gold twined Bakers Twine. There's some ink sponging done on the background too. Adding pearls down the body of the framelit shape complete the look. PS: All supplies for these projects are from Stampin' Up! and current ones can be purchased from my SusanSalutations online store if you live anywhere in Australia. PPS: You can read more about PaperCraftCentral Susan here.